Previously I told some of you about certain aspects of our garden. 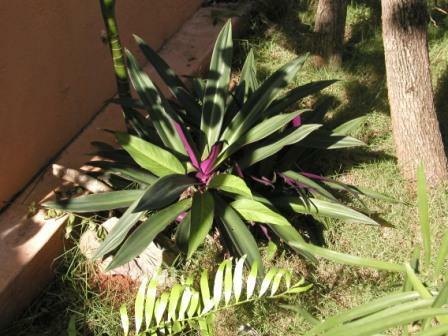 For example, I’m pretty sure that I mentioned the ubiquitous green and purple plant that is succulent and juicy enough to be useful in extinguishing a fire–a fire of brush and garden debris, for example. Junior (ah, remember Junior?) and I spent the better part of a week building a monster pile of this stuff and I’m only now getting it to smolder away. That was 3 or 4 weeks ago, and the garden is overgrown again, but this time it’s in bloom. Salmon and red and purple and yellow and orange and more reds: the blossoms are phenomenal. The lavender orchid growing in the crotch of a tree beside the wooden walk winding down the hill has been in bloom for more than a month that I know of. And even though this property is fairly small (a little less that 1,000 sq. meters) there is a panoply of plants that I’ve yet to fully comprehend. That innocent-looking but savage little holly-like leaf that raised a blistering welt, for one. But my favorite was taking a break from painting the other day and looking up and seeing: Bananas. Mind you, this is a big plant and the hand of bananas is itself quite large. And it’s 30 feet from our front door. And it was a surprise. Just when I was believing that I had it all mapped out, I stumble on a banana tree peering from beside the A-frame guest bungalow. It’s better bananas than another bed of the devil holly plant, that’s for sure. When I lived in Portland and again in Seattle I planted apple trees on our property, and we always enjoyed the fruit. Never in my wildest imaginings did I suspect that at some point we’d have bananas growing in the yard. But there you have it. Life and gardening sure take some interesting turns. I blame a different, less common plant for the wound. But I still resent the smothering capabilities of this guy.